This necklace takes advantage of the new larger link oval chain in sterling silver that is now available in bulk lengths from many popular jewelry suppliers. 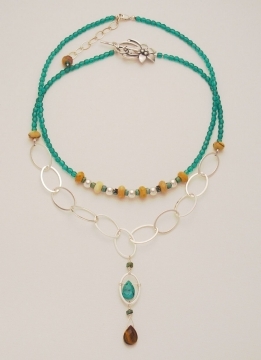 In this necklace project design, I have wire-wrapped a turquoise briolette bead inside one of the wire links, to create a focal point in the pendant drop. 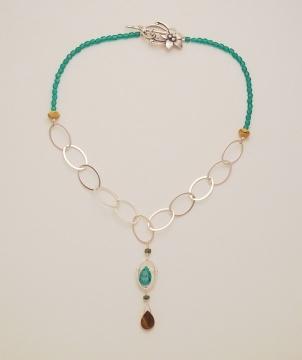 The link chain has been attached with flexible beading wire, and completed with glass crystal turquoise beads. Accents of a tiger's eye briolette bead, and some heishi turquoise beads complete the design, along with a decorative sterling silver clasp. Want to learn how to make this necklace, or a variation of it for yourself? Let's get started! Notes: Decide how long you want your handcrafted necklace to be. I went for a standard 16 inch length, so I have about 8 inches of large oval link chain, and enough glass crystal beads to complete the remaining 8 inches on flexible beading wire (less the added length for your choice of clasp). Enough beads of your choice to complete the remaining 8 inches. 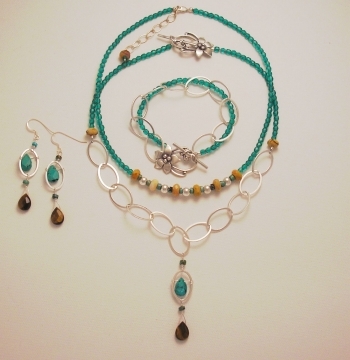 Here I am using glass crystal beads (turquoise colored). You could also use leather, suede or other corded material if you prefer. Sterling silver wire for wrapping the briolette beads and attaching the pendant to the bottom link. I use 24-26 gauge half-hard sterling silver wire, but use whatever wire you prefer as long as the wire diameter fits through your bead holes. Two larger accent beads of your choice for the chain where it connects to the flexible wire. Here, I am using tan jasper beads. Clasp of your choice. Here, I am using a decorative sterling silver flower toggle clasp. You may use an extender chain and clasp if desired. Let's start by making the focal pendant. 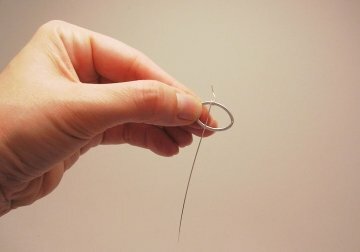 Cut a short length of sterling silver wire, about 4 inches. TIP - If it is too long, you won't be able to wrap it inside and around the oval link. Wire wrap the lower briolette bead. Before completing the loop at the top and attaching it to the bottom of the oval link, add an accent bead. Here, I have used a turquoise heishi bead as my accent. Complete the loop on top of the briolette bead while attaching it to your link chain. Now you will create a link and bead component, and attaching the link to the center link of your length of link chain. 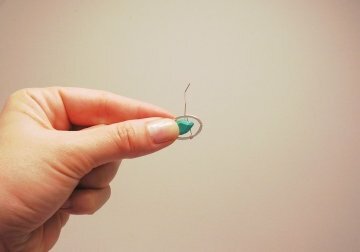 Using your wire, create a loop and attach it to the top of your link component (see the How to Wire Wrap a Basic Loop Instructions if you are not familiar with this technique). Add a center accent bead. In my example, I have used a turquoise heishi bead. Complete the second side of the loop, and this time, attach the entire briolette link component to the center link of your chain--measure your chain, or count the links. You should have an uneven number and attach the pendant to the center. TIP - Pick up the chain in both hands and let it hang down, and the center link should become obvious. Cut two lengths of flexible wire (one for each side), allowing a few extra inches to play with. 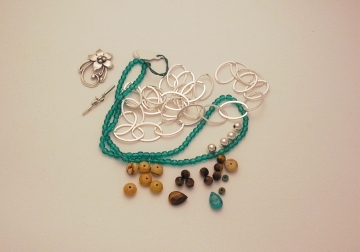 Attach the flexible jewelry wire to either end of the link chain with a crimp bead (see How to Use Crimp Beads if you are not familiar with this technique). Now begin stringing your remaining beads on either side. Once you have strung all remaining beads, check your necklace length. Make sure you allow room for the clasp, which will add some length. Add or remove beads to make sure you have the correct length. Next, attach each side of the clasp components, using crimp beads. That's it! Here, I have paired the linked chain necklace with a second matching necklace, which can be worn alone as well. This is a simple design of glass crystal turquoise beads, and in the center I have alternated tan jasper beads and smooth round sterling silver beads, and additional heish turquoise beads as accents. I have attached a sterling silver extender chain to this necklace so the length can be adjusted, which is especially nice if it will be worn with the longer link pendant necklace. If you don't have briolette beads, you can easily vary this design by using 2-3 smaller beads inside the link frame. Or, try attaching a "spray" of tiny beads to the bottom of the link. Instead of glass or crystal beads, consider using leather cord for a more contemporary look.